Growing Bhut Jolokia seeds will give you the hottest chiles in the world according to the Guinness Book of World Records. This is such a potent chile that one seed can cause intense pain for up to 30 minutes! However, the seeds are not easy to find and germination is often unsuccessful. Bhut Jolokia is a chile native to northeast India. 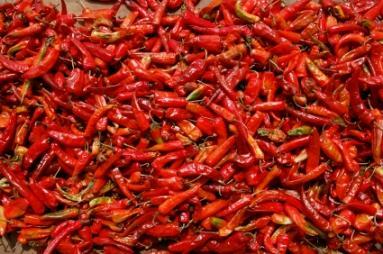 While it has likely been used for a long time in various regions of India, it was discovered by Professor Paul Bosland of New Mexico State University's Chile Pepper Institute while he was visiting India. Seeds from the Bhut Jolokia, a name that means ghost chile, were sent to the University for testing in 2001. A scale of measuring heat called Scoville Heat Units shows that Bhut Jolokia has 1,001,304 SHUs. Compare this to the former hottest chile, Red Savina, which measures less than half that (248,556 SHUs), and average jalapeño peppers which measure at 10,000 SHUs. You can see why this was such an amazing find. Bhut Jolokia seeds are difficult to grow. So difficult in fact, that it took three years for the University to produce enough seeds for field testing of this hot chile. They had to resort to cultivation in insect-proof cages. When they plants did produce fruit, it was very sparse. It typically takes 90 to 120 days for peppers to be harvested. 90 days will give you a green, but still very hot, pepper. 120 days will provide you with a red, ripe pepper. Because of scarcity, you can try to save seeds from your red peppers and growth them next year. Your own Bhut Jolokia seeds can be started indoors in peat pots filled with compost and then moved outside when the weather is warm. Chiles like a rich, well drained growing medium. If you cannot provide your own compost, you can find a good mixture of peat and compost at your local garden center. Seeds that have been treated with a fungicide have a better chance of germinating. Some seeds sellers also offer a special germination solution that will improve your chances of success as well. Once planted, your seeds will needs to be kept warm. This can be accomplished with special warming trays or by placing planted seeds in a warm location in your home.Once sprouted, light is essential for your plants to be healthy. If you are unable to provide a sunny window or greenhouse, consider purchasing a grow light. Once the weather outdoors is warm with all danger of frost long past, you can transplant your seedling into outdoor containers or directly into the ground. With most hot chilies, proper pollination can sometimes pose a challenge. If you find that your plants are producing flowers but not chiles, you might need to give them a helping hand.Try using a small paint brush or cotton swab and gently dab some pollen from a flower and transfer it to another flower. This may be especially important if you are growing your chilies in a greenhouse or if you are using insect-proof cages as were used by the Chile Pepper Institute. Seeds of the Bhut Jolokia can be difficult to obtain. However, there are two sources that you can try. Local Harvest offers Bhut Jolokia as well as many other chile varieties. New Mexico State University sells these seeds directly. For $6 you get a packet of 10 seeds.